Thirsty Script font from Yellow Design Studio is a contemporary script conceived as a marriage of elements from vintage signage scripts, Wisdom Script, Deftone Stylus, and Lobster. The result is a typeface with a ‘new meets vintage’ vibe. 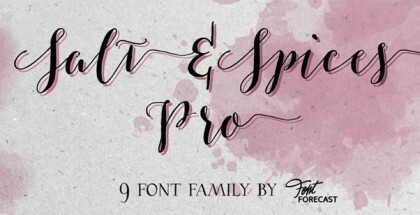 It’s friendly with an edge…a mixture of retro script, modern sans serif, and a shot of caffeine. Thirsty Shadows are nicely offset automatically, but this distance can be easily customized for all weights except Light (which is too skinny to offset further without edges peeking out). Includes ligatures that correct shadow overlap issues. In Illustrator set area type options to Em Box Height for proper shadow alignment. In Photoshop align shadows manually. Thirsty Script Shadow Bold is a free font.